A new 660-ton Stamtec transfer press at Genesee features a compact Tomac feed line comprising a combination servo-feeder/straightener with uncoiler and coil cart. Material payoff is from the back of the coil, to provide slack that helps even out material feed into the straightener. Expansion has been on the mind of the Genesee management team for several years. Since May 2010, when Wright joined the company, revenues have more than tripled, and manufacturing floor space has doubled, to 78,000 sq. ft. Now the company has its sights set on expanding its customer base. What’s in the New Sandbox? During the last 6 yr., Genesee has welcomed plenty of new equipment to its newly expanded metalforming plant, highlighted by six new automated welding cells (resistance and arc), with plenty of room for more. And, most recently, the plant welcomed a new 660-ton Stamtec transfer press into the plant, that management believes surely will help the company expand its portfolio of work and customers. 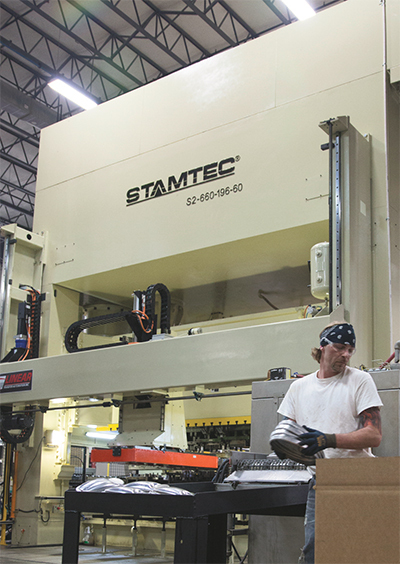 Genesee and Stamtec worked together to specify the press for a takeover job handed over from Genesee’s largest customer: stamping 1.3 million muffler end plates per year, of 1.5-mm Type 409 stainless steel. Moving forward, though, the goal is to leverage the transfer press to expand beyond automotive work. Not only does the new press provide more tonnage than previously available from Genesee’s presses (500-ton max. ), but its bed size (196 by 60 in.) is nearly double that of its other presses. And, it’s the firm’s initial foray into transfer work. That said, Wright was careful to ensure that the press, when installed early in 2016, had dies ready to run. “That’s why the board green-lighted the project,” he says. Those existing tools, takeover work from Genesee’s largest automotive customer, stamp muffler end plates from 1.5-mm Type 409 stainless steel. But, says Wright, at 1.3 million end plates/yr., the job consumes less than one shift of the press’s run time. “While we specified the press specifically for that job, we’ve got plenty of press time for sale,” he adds. There are relatively few big-bed presses in the area, says Wright, so the press—which can run progressive dies as well as transfer, with the transfer system parked up and out of the way—gives Genesee a competitive edge. Neighboring OEMs are taking notice, among them the area’s HVAC and appliance OEMs. 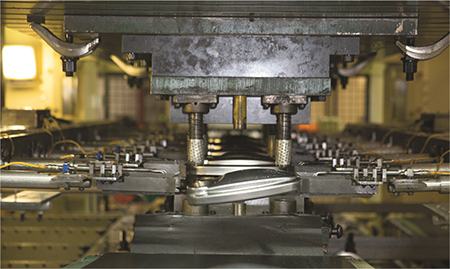 Linear Transfer provided the through-the-window servo-transfer system for the press, which provides a maximum 900 mm of feed stroke, 350 mm of clamp stroke and 300 mm of lift. The press is a crank-driven plunger-guided model with an 18-in. stroke and a speed rating of 15 to 30 strokes/min. Powered slide adjustment is 8 in., and window opening is 90 by 76 in. The press takes direction from a Wintriss WPC 2000 and SmartPac 2 automation control. Installed through-the-window is a Linear Transfer full-servo transfer system synchronized to press-ram motion via encoder feedback, with 900-mm max. feed stroke; 350 mm of clamp stroke per side; and 300 mm of lift. Payload: 150 kg (including tooling). It boasts a Bosch-Rexroth Indramat control system and 200-program storage capacity. 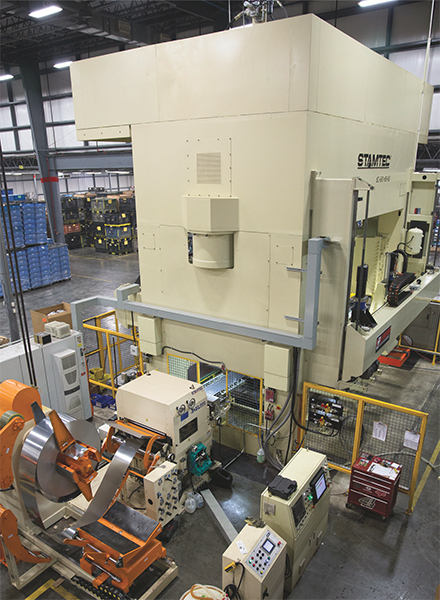 “In addition to providing what essentially is a custom press, with a much larger bed size than is typical for a 660-ton press,” says Wright, “Stamtec provided turnkey support. That included specification and integration of the transfer system, as well as the compact coil-feed line that serves the press, whether running in the progressive or transfer mode—with first-station inline blanking. That turnkey support was perfect for our needs, including all of the programming required to launch the initial dies running in the press. The feed line is a Tomac (a Stamtec sister company) Model TLF3-800 unit that combines a servo feeder-straightener with an uncoiler and a 5-ton-capacity coil car. It pays off material from the back of the coil, which allows a bit of slack to help even out material feed into the straightener. An optical sensor provides variable-speed loop control. Maximum coil width is 800 mm; material thickness can range from 0.5 to 3.2 mm. When we visited, the plant was busy preparing for the first of the new work slated for the Stamtec press—six progressive dies comprising 12 part numbers for a customer in the commercial air-conditioning industry. That job, slated to kick off later this summer, will run on second shift, saving valuable first-shift press time for more complex transfer jobs. Long-term, Wright expects Genesee’s new showcase press line to tackle several large projects on a regular basis —contracts he’s finalizing now. In the meantime, he’ll continue to fill press time with short-term takeover work. In the end, Wright expects a 5- to 7-yr. payback on the new press line, based largely on how well the firm attracts a new customer base.